Hi! When you’re an adult you don’t really get summer vacation, or at least you don’t when you’re a writer, because you usually have a book due, as I did this summer . 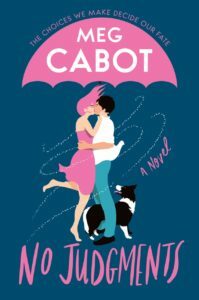 . . a book that I still haven’t quite finished. But it’s ALMOST done! 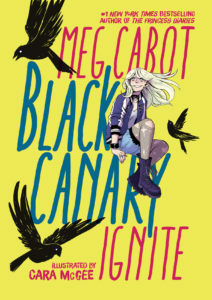 With luck, it will be out August 2019 . . . which I realize is before Black Canary: Ignite, my middle grade graphic novel, which will be out in October 2019. 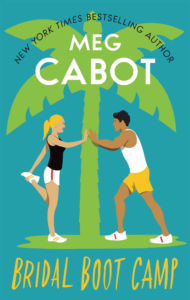 I do have a title–and even a cover–for this new book, which is an adult contemporary, but I’m waiting for final approval from HarperCollins before revealing them. So what I did for my summer vacation was spend almost every day working . . . EXCEPT for a few brief weeks I spent overseas going to . 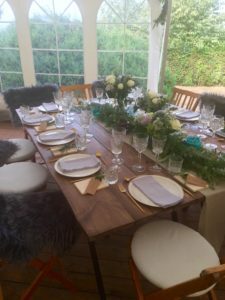 . . a wedding! 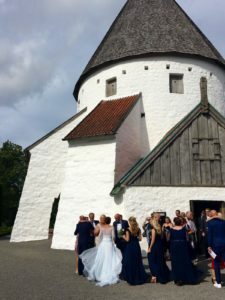 That’s right, I went to a wedding in Denmark, of all places, which I think should count as research, considering the fact that I write romance (usually with a little mystery, humor, and suspense thrown in). There was no mystery at the wedding, unless you count the fact that the bride and groom got married in a medieval church that was supposedly constructed by Knight Templars (or a Knight Templar was buried in it, or the Holy Grail is under it, or something. Look, I was off duty for the wedding). 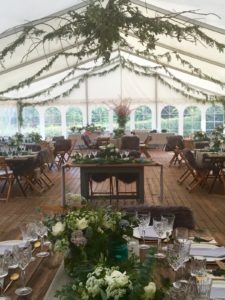 Anyway, who cares about that, look at the wedding tent! I know, right? The Danish know how to do everything right. 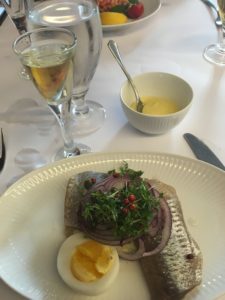 Just look at this smorrebrod (open face sandwich) I got at my favorite restaurant in Copenhagen, Told and Snaps (don’t even get me started on snaps, Danish akvavit. By don’t get me started I mean bring me one right now). There is gluten free bread under that herring. 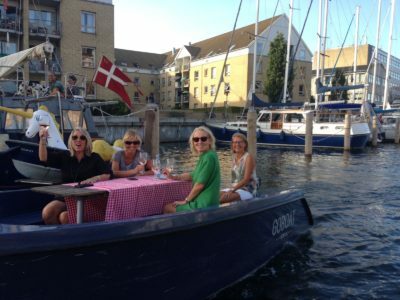 These Danish ladies we encountered while boating in Copenhagen know exactly how to spend a summer afternoon. Note the inflatable unicorn in the background. 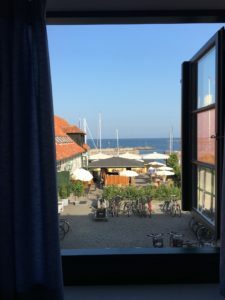 Danes are very emphatic about something called “hygge” which means a feeling or mood of living well and contentedly (I feel like it’s a lot like Netflix and chill only with more alcohol and blankets). That’s why when you go to a bar or restaurant or wedding in Denmark, you’ll always find cozy or furry blankets tossed over the backs of chairs. They want you to curl up and stay awhile. See? Fuzzy blankets over the backs of the chairs at the wedding. But of course I had a book due, so I couldn’t “hygge” all the time. I spent a lot of time in my hotel room, writing. Which wasn’t a hardship, because look at my view! 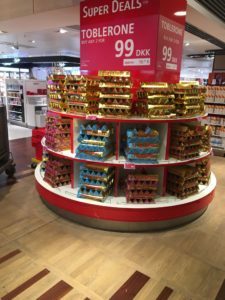 I was also able to comfort myself with the vast amounts of Toblerone and Nutella that was available everywhere, at very low prices, and sometimes free with breakfast. Remember Joey from Friends and the giant Toblerone??? Often I worked in the hotel lobby, because housekeeping would need to clean my room. If you’ve ever worked in a hotel lobby, you know that is where you see extraordinary things, such as people having meltdowns for no reason, and other people who are trying to get their work done while housekeeping cleans their room. 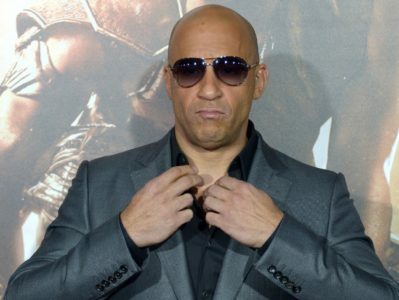 Other people such as VIN DIESEL. 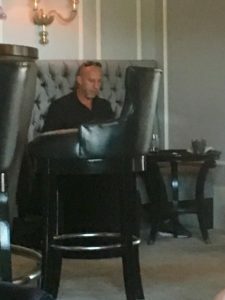 No one who was there agrees with me that that was Vin Diesel in the hotel lobby (okay, it was the hotel bar, but whatever), but that is OBVIOUSLY him. You can clearly see that it is him!!! Anyway, my trip was lovely, and so was the wedding, and so was Vin Diesel (obviously I did not speak to him because he was working, like I was, and people working have respect for one another), and I learned a lot of new things and got a lot done. That’s what I did on my summer vacation! 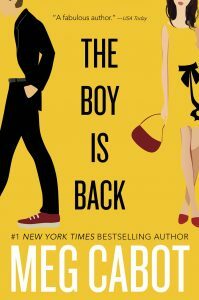 Which leads me to this–I’m going to be taking another mini working vacay, this one to Jersey City in October to interview mega-bestselling author JAMES PATTERSON live on stage about his new book for tweens, MAX EINSTEIN! 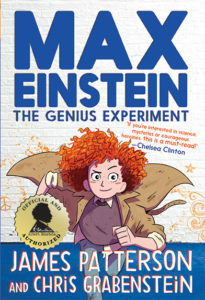 The event will be on October 9 from 6:30-8:30 at the Loews Theater, and is ticketed (but one ticket admits two people AND gets you a signed copy of MAX EINSTEIN). You can find out more details (and buy tix) here. What will I ask James Patterson? Stuff about the book, of course! 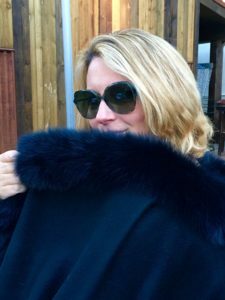 And what it was like to be on Castle! (Kidding. Not kidding.) And anything else you Tweet or FB me. Remember that this is a kid’s event so keep it age appropriate. Okay, well, that’s it for now, I have to go write some stuff. Hope you had a great summer, and don’t forget to take time out from work to get a little hygge!